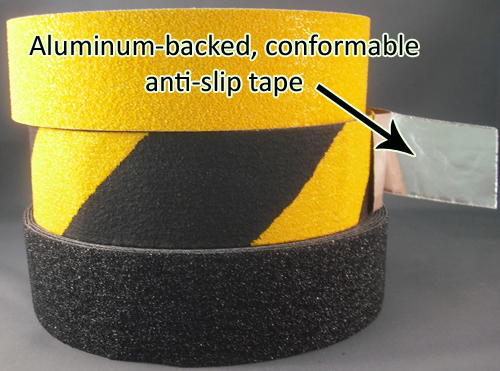 Ideal anti-slip (non-skid) tape for use on irregular surfaces and can be hammered into place. It’s especially good for use on Diamond Plate. A mallet (not supplied) and the aluminum adhesive backing cause it to adhere to the contours of any irregular surface. Black, yellow or black/yellow (hazard) coarse conformable anti-slip tape: 2 inch x 60 feet,$53.97 per roll. Other sizes available on request. Maximum width is 39.4″. Call (1-800-988-6721) or e-mail us for large or custom orders. FREE shipping for orders over $120. Although we don’t normally carry it on stock, we can quickly order you this same conformable tape in the standard grit size (in the same colors shown above as well as white). The tape shown here is coarse grit.